Rosebud Salve. Minted Rose Lip Balm. Strawberry Lip Balm. Want all three? Then you'd best get your hands on the Rosebud Perfume Co. Lavish Layers Gift Tin ASAP. For a limited time only, the three cult faves are available in an utterly convenient square tin. 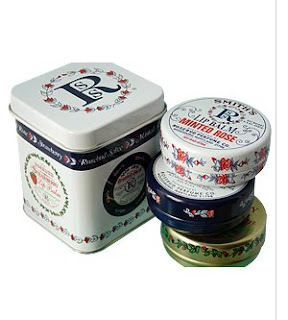 Now, you might already be aware of my fascination with Rosebud Salve. (Click here for a recap.) But this is definitely a way to test out two of the brand's other bestsellers for a mere fraction of the price. Considering they each retail for anywhere from $6-$8, it sure does make it convenient to get them all for only $16. While Rosebud Salve is still my fave, I am definitely enamored of the other two. Strawberry smells exactly like a Strawberry Shortcake doll -- one of my faves from childhood -- while Minted Rose has a slight menthol-like aroma that really feels fresh and somewhat zesty. And the tin is just the cutest. The entire set really has a vintagey feel that just adds so much to any desk or vanity! This set is available at beautyhabit.com. Posted by Jamie at 7:00 AM Labels: lip balm, Rosebud Perfume Co.